The dolphin nursery pool is the most old-fashioned (long and narrow, painted blue), smallest and shallowest enclosure for cetaceans they have left in the park. And SeaWorld now has a new roller coaster, which goes right past it. This is where they keep their most vulnerable dolphin inhabitants: right next to a screaming roller coaster. 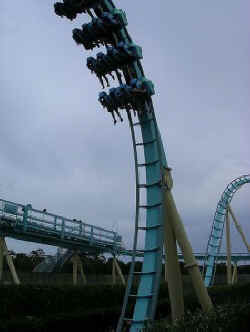 The new roller coaster at SeaWorld Orlando. it screams right past the dolphin nursery where the most vulnerable animals are kept. The dolphin petting pool no longer allows the public to feed the dolphins without direct supervision. Part of the wall is now set off for “feeding” and part of it for “petting.” As far as I could tell, no one gets to pet a dolphin in between the feeding times. They wait at the wall, hands in the water, but the dolphins ignore them. Without fish, they have no interest in being touched by strangers. The dolphin show was a cross between a Las Vegas Cirque du Soleil extravaganza, a Disney on Ice performance, and a dolphin show. 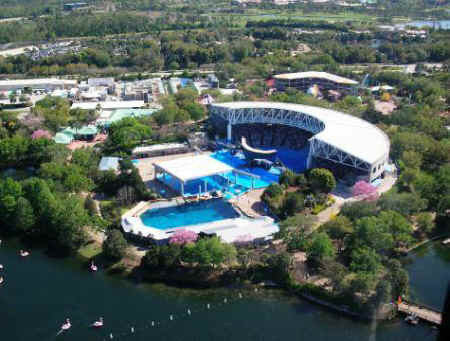 SeaWorld claims that it does much to educate people, especially children, about the animals in its shows and the benefits of its parks to conservation. But there was no factual information provided during the performance at all. Some factoids were provided before the show started. These were pre-recorded by children, and went along the lines of “Hi, I’m Suzie. I’m 10 years old. Did you know that SeaWorld’s dolphins can weigh up to 500 pounds? That’s more than two professional football players!” It was very difficult to hear these pronouncements over the noise of the crowd. As far as I could tell, most people were not even aware of them. Then the show started, and there was no factual content at all. It was all about a girl having a dream with dolphins and birds and spirits. They don’t even tell you the species of dolphins used in the performance (bottlenose dolphins). There were human acrobatics, wild costumes, a lot of dolphins leaping, and some macaws flew around. (An Andean condor who was supposed to fly overhead refused to do his part and brought the show to a halt at one point – they let him go back into his aviary without further ado). The complex as seen from the park's viewing tower: from right to left there's the performance tank, which is in shadow; the middle tanks are brightly sunlit (behind the curved backdrop of the performance tank stage); the square-shaped tank with Tilikum is under the roof; and then there's the "Dine with Shamu" rectangular tank with brown "rocks" around it in the foreground (this tank is called "the Cove." This tank is usually where Tilikum is held, but they may not be letting him use it during the day right now because I imagine they don't want people to ghoulishly come to see the whale who killed the trainer. After the dolphin show, we walked around some of the other exhibits. These, again, are supposed to highlight the educational value of SeaWorld, but the manatee rescue exhibit is the only one with any easily noticed signage. It also has an old-fashioned wrap-around 3-D film about manatee rescue. The manatees themselves don’t do much, of course. Not many people seem to visit this exhibit. The Wild Arctic exhibit had almost no signage at all, one sign had no light on it (it was in a corner in shadow and might as well have not been there at all), and the only truly educational thing, an alcove with three or four touch-screen monitors with quizzes and other interactive content, was empty when we came upon it. It is on the way out and most people pass it by as they head for the exit. We stopped to see what the touch-screens said, and a family with two kids came in and used one of the monitors, probably because they saw us in there. We headed back to Shamu Stadium for the “Believe” show. The original Shamu was the star of a SeaWorld show in San Diego in the 1960s. After she died, SeaWorld continued to use her name for various other killer whales, also known as orcas. Before the show started, there was some educational content – a series of questions was asked of the audience, mostly focused on husbandry, like “How much fish does Shamu eat a day? How do you train a killer whale? How cold is the water in Shamu’s enclosure?” A couple of questions were a little more general: “Why are they black and white? How big do they grow?” But the show itself had no factual information at all. It was all about a boy who dreams of becoming a trainer, whose story is told through a video on a big screen. While kayaking in the wild one day, he sees a whale, and proceeds to carve a whale tail (a replica of which is of course sold in the gift shops). He decides he wants to grow up to be a trainer and we’re told that the boy “believed” hard enough so his dream came true – at which point the live part of the show begins, with a trainer playing the part of the boy. We went to this show twice, and there was a different trainer playing the role of the boy the second time. The trainers (there are several in the show) didn’t swim with the orcas at all – this is a major change in training and performance protocols after the incident with Tilikum. 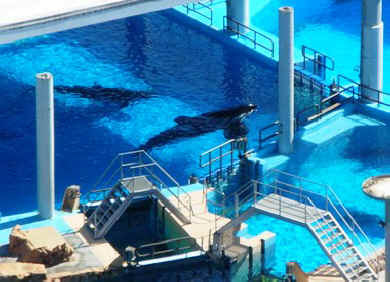 Instead, they ran along the outside of the tank wall with the whale following them, and did poolside interactions. At one point they put all the whales in the holding tank and five trainers then swam out to the outer wall, sat on it, and then the whales were let back in to interact with the trainers who were sitting on the pool wall. But that’s as close to “in-water” as they got. Tilikum from the viewing tower. He is logging by the gate and he really didn't move from this corner of the tank for about an hour. You can see the other whale swimming around, but Tilikum did not react to her - he essentially ignored her. It seems perhaps he has good days and bad days. And SeaWorld seems to be trying to mix it up with the whales, changing the composition of who is in what tank and so on, to perhaps get him to show some interest. We came back for the 2:30 Believe show, and sat high up in the bleachers this time so we could watch Tilikum the whole time. This time, we definitely saw one other whale in the back with him – I think it was one of the adult females. Tilikum essentially remained motionless, logging in front of one of the gates separating the back tank from the middle tanks. The other whale was relatively active, swimming around, at one point bumping Tilikum (deliberately, one assumes), but Tilikum did not react to her. I think there were a couple of trainers back there during the show, to distract the other whale from what was going on in the show, but Tilikum did not move from that corner. All told, we were able to observe Tilikum for about two and a half hours. He appeared to be alone for about an hour, was definitely with another whale for a bit more than an hour, and with his trainers (at a distance, with the fire hose) for a bit less than a half hour. They were probably “interacting” with him for a total of 30-40 minutes between the shows, but we didn’t see the entire interaction because we were walking around the stadium and observing three other whales in the underwater viewing area. Tilikum seems very depressed. He seems focused or fixated on the gate into the performance pool and/or the gate into the “Dine with Shamu” pool. He is not being used in the show, he appears to be spending a lot of time alone (even when another whale is in there with him, he didn’t really interact much with her) and is not being allowed into the tank he is usually held in – and he seems to know it. Maybe he’s allowed in there at night. Naomi Rose, Ph.D. is Senior Scientist for Humane Society International, specializing in international marine mammal protection issues. She has managed a campaign to address the welfare of captive marine mammals for more than 15 years and she studied wild orcas for her dissertation research, in the late 1980s and early 1990s. She recently paid a visit to SeaWorld in Orlando, Florida, and made these notes on the visit.